A while back, I posted a classes overview for a B/X-style game. That was missing the necromancer and the thief. This is my work so far on a necromancer class. I’m going to do this one a little differently than the others. I realized that I was writing more rules than flavor, because no existing class really represented the necromancer I wanted. I want a necromancer that focuses on raising and commanding the dead, like the necromancers in the fiction of Clark Ashton Smith or the necromancer in Diablo II. I thought about using the BRW Necromancer (which I like), but the BRW Necromancer is very much a spell-casting specialist wizard. Another option is The City of Iron Labyrinth Lord Necromancer (free PDF here). That is another great class, and includes more than 50 new spells; by all means, you should go take a look at it. But it is not solving the problem that I am trying to solve. The Undead Master from The Complete Book of Necromancers has some good qualities, but like most D&D necromancer classes it suffers from being designed only for NPC use. This necromancer that I have designed is not a magic-user with a different spell list. In fact, this necromancer can’t even memorize spells (at least, I’m leaning in that direction). Instead, from the very beginning, this necromancer is engaged in raising the dead to do his bidding. In Talysman’s formulation, this necromancer gets undead minions to solve problems for him. In some sense, from a game perspective, this class takes the idea of retainers and builds a class around that. The main objection to this kind of class is that it can result in an army-of-one. Even if that does not end in a more “powerful” character, it can still slow the game down by requiring lots of rolls during one player’s turn. Fourth edition takes the most extreme position on this problem: you need to spend your own actions to control animal companions, familiars, or summoned creatures. This army-of-one problem does not really bother me though, for the following reasons. I’ve played characters with several animal companions, and it never seemed to bog down. Any character can have hirelings, which can result in the same problem. Necromancer minions are not under the control of the player in the same way a PC is; the player gives commands, but the referee interprets how the minions carry out their actions. Based on these rules, the number of minions the necromancer can control is based on level, so it will be a long time before there are many of them. Time-saving rules: one attack roll for all undead of the same type (see below). Minions could be used as pit-trap detectors (this problem does not hold for mortal hirelings, as they would not consent to being so used). However, is this really any worse than probing with a 10 foot pole before every step? (Actually, yes, it is, at least a little, because probing ahead with a 10 foot pole slows down exploration.) In the end, I don’t think this is a big problem though, for one simple reason: creating minions costs money and finding minions is risky and requires adventuring. Thus, minions are not a resource to be thrown lightly into a pit trap. But I’m getting ahead of myself. The quantity and potency of undead that can be controlled by a necromancer is as a magic-user’s spell memorization table, with hit die substituted for level. For example, if a magic-user of equivalent level could cast 2 first level spells and 1 second level spell, then the necromancer could control two 1 hit die minions and one 2 hit die minion. A higher-level slot may be filled by a lower-level minion. Following the above example, that could mean either two skeletons and a zombie or three skeletons. Once an undead minion is under the influence of a necromancer, the necromancer must issue commands. 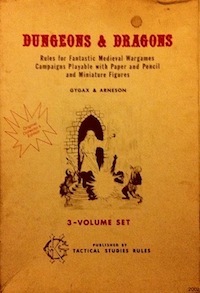 Such commands are minor incantations, and require that the necromancer have use of voice and hands (a weapon or implement may be held, but may not be used during the command). Such a command requires one combat round and functions in the same way as casting a spell. Once so commanded, an undead minion will forever attempt to fulfill their charge, with various degrees of creativity and cleverness, to be determined by the referee in line with the nature of the type of undead in question. For example, a ghoul’s overwhelming desire is to feed, and all actions will be biased toward that end. Skeletons and zombies are virtually mindless, and will exhibit no creativity with regard to fulfilling commands. No minion will knowingly cause harm to their master or their master’s close associates. Though the necromancer can only issue one command per round, all minions will continue to pursue their last command. How do necromancers acquire minions? One way is to find previously created undead and exert control over them. This works exactly as a cleric’s turning ability, except that the end result is servitude rather than fleeing. The other way is to create or summon minions. As the necromancer advances, each time a new strength of undead can be controlled, the necromancer gains access to rituals for creating or summoning one iconic type of undead. For example, at fifth level, a necromancer gains the ability to maintain control over one 3 hit die undead, and one ritual to create a 3 hit die undead. Each ritual also has a components cost, which is consumed in the ritual. The necromancer starts with the 1 hit die ritual for skeleton. Other rituals can be found through the course of adventuring. Costs are just guesses for now. These minions are consumable in a way that something like a magic sword is not, but in the end if these costs are appropriate or not depends on how wealthy PCs are likely to get through adventuring in any given campaign (I need to look at XP advancement values and compare to treasure hoards). An appropriate body must also be procured for the corporeal undead. Perhaps more specific components will be required also, but from the point of view of basic game-play, the cost is the most important thing (though I love the idea in Carcosa of binding particular components to hexes on the wilderness map). Rituals to create necromantic golems are also possible, following the same rules. The necromancer binds a spirit into the inert prepared golem body, thereby rendering it animate. Golems so created should remain within the 1 to 6 hit die range; these are not quasi-artifacts like iron golems. Necromancers may restore HP to minions by performing particular rituals. A necromancer that spends one day so engaged will restore 1 HP to each minion controlled. This must be a full day of work, and cannot involve travel. Treat it as natural healing for game purposes. When the necromancer controls more than one undead of a particular hit die value during combat, one attack roll can be made per type of undead to speed up play. Generally, one attack roll will be made for each type of undead under the necromancer’s control to expedite combat. The spawn of undead controlled by a necromancer (for example, those slain by wights or wraiths) are not automatically under the control of the necromancer. Control must be asserted as normal. If a necromancer is slain, all his undead minions are immediately freed. In the case of mindless undead, they will continue to attempt their last task until destroyed or controlled by another necromancer. In the case of sentient undead, such as wraiths, the undead will immediately become hostile to the necromancer and any of his allies, and attempt to take revenge for the enforced servitude. Spells that have an obvious connection to necromancy can be cast without chance of failure from scrolls. All other spells require a successful intelligence check. When a necromancer reaches name level and builds a stronghold, 1d4 apprentices of level 1d4 + 1 will seek to learn from him. In addition, a necromancer’s stronghold is enchanted with powerful magic that extends the necromancer’s control over undead within his own domain. Within the bounds of the stronghold, the necromancer may control four times the normal number of undead. Can minions use equipment such as armor or weapons? I’m leaning towards no. I thought about including some anatomist or doctor skills (embalming, tending wounds) due to the knowledge of life and death (a doctor is just a kind of necromancer, right?). I think this necromancer is more mystical and fantastic though, so probably not. I’m not looking to model Dr. Frankenstein. Do I really want to completely avoid spell memorization? Maybe, in addition, have a limited spell list, like the AD&D illusionist? But with fewer spell slots, like the second edition bard? Magic item creation by binding spirits? Are the advancement tables in any of the major retro-clones Open Game Content? Should dispel magic be able to break the link between a minion and a necromancer? Necromantic cantrips for free? Examples: wilt a rose, cause a corpse open its eyes, make a mouse skeleton dance. Should necromancers acquire the ability to issue commands telepathically at higher levels (as in, without the requirement of the incantation)? What should the range of the command incantation be? I’m thinking that it should be based on level. This class clearly needs play testing, but I’m really excited about it. It seems to have all the qualities I am looking for, and is not just a skin-job on another class. More details about particular rituals will be included in later posts. Talysman has also posted a great cleric-based necromancer. This entry was posted in Uncategorized and tagged class on December 3, 2011 by Necropraxis. 1. I lean towards yes on this one, in terms of armour and weapons (not things like thieves’ tools though!). If the necromancer wants to spend money kitting his minions out then it seems like it should yield some reward. 5. The Labyrinth Lord declaration of OGC states that all tables are OGC. I’d say only skeletons and zombies may wield weapons or wear armour – although I only say it instinctively, I have to put some more thoughts into this. Really some nice thoughts for a class! I like the “quick fix” for undead control via the MUs spell memorization and the necromancer cantrips are a nice way to bring some flavour into the game! 1. I’m leaning towards yes here. Maybe I would allow some sort of random table with some residual abilities of the animated dead (maybe one roll per hd of the undead? ), like, what weapons preferred or some random traits. One positive effect would be that it gives the former life of the corpse some importance so that a necromancer not only uses corpses, but also has a need to do some research about that (to get some influence on the random table). 3. How about using MUs memorization table for either uttering an specific command to an undead the necromancer controls (the incantations) or using it to cast something from his spell list? 4. Maybe on the spell list? 6. Yes, clerics should also be able to have something to say about the matter. 8. Maybe it could be an option, like a high level spell he is able to acquire. 9. Like in 3., you could also use the turn undead table (with opposite effects). I remember from somewhere that casting the opposite of the clerics heal mends an undeads damage (might be on the spell list, too). Could be the quick (high level) solution, while it normaly takes time and resources to achieve some mending. Interesting! Coincidentally, I was actually thinking along the same lines, re-skinning the “cleric without spells” as a necromancer. No undead creation to start with, but Animate Dead and a couple other death magic effects can be cast at will using the turn undead reaction roll, with spell effects treated as an undead creature of the same HD as the spell’s level. Skeletons and zombies require a corpse of some kind but are otherwise “free”, but other undead (and ghosts bound to objects) are handled with standard magical research rules, using HD as spell level. Yeah, my concern about equipment is more about keeping the character sheet from getting too complicated. Maybe if it is limited to armor and weapons that would not be too bad. Good to hear about the tables. In a final version, I can probably use them to include an advancement table inline. Yes, turning should definitely affect necromancer minions. I like the idea of making it break the bond with the necromancer, perhaps with the T effect. Great idea on taking the command incantation range from the turning ability too. I’d love to see your take on the cleric necromancer. The magic research rules are one of the parts of the game that I’ve always felt like I never really understood. I should probably read up on them more. I am hesitant to make any of the rituals totally free, as I don’t want the minions to be too disposable. Thanks all for the good ideas. I’d respond in more depth but I’m travelling right now. Edit: added a link to Talysman’s cleric-based necromancer.